The Brita Atlantis water filter pitcher is a high-efficiency design from Brita that has a generous two-quart capacity, yet still fits easily into your refrigerator with its space-efficient shape and comfortable handle. 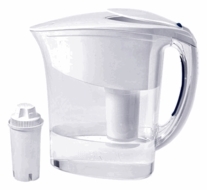 We also carry long-lasting replacement filters for this Model 42412 Brita Atlantis water pitcher that filters eight eight-ounce glasses at a time. The Brita Atlantis water purifier has been tested and certified by NSF International. Read our website blog for healthy living and energy saving tips.